You often share your favorite moments on Instagram with the perfect filter and relevant hashtags, but eventually those memories get lost in your feed. 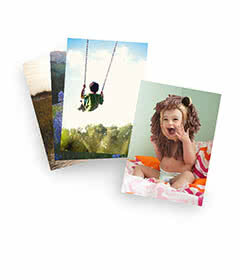 Turn your pictures into Instagram photo books. We created eight examples of how to make an Instagram photo book by transforming your feed into something special for yourself or a friend. You’ll love using templates, embellishments and fonts to pull together a spread you’re proud of. Added bonus? If you’re gifting the photo book for a birthday, anniversary or holiday, we’ll wrap it in a gift box fit for the occasion. Have you mastered your baking skills? Consider turning your homemade recipes into a personalized cookbook that you can share with your family and friends. You can record your own take on classic recipes, similar to handwritten recipes you may have inherited from a loved one. Don’t forget to get creative with your cookbook! Include pictures of the times you spent in the kitchen as well as the final dessert. The first few months welcoming new furry friends into your family are both exciting and adorable, but often times they go by too fast. Create a photobook of your puppy’s first year! You’re bound to have endless pictures of your pups on your Instagram, so turn them into a photobook that you can use to reminisce years down the road. Turn your favorite wanderlust moments into a customized photo book! Tell the story of your travel memories with beautiful shots from around the city, top places to eat and words you learned along the way. Not only will it be a way to reflect on exploring a new place, but it will also remind you of moments you can share with your family and friends! Looking for a creative way to surprise your loved one for a birthday, wedding, anniversary or special event? Create a photo book using Instagram photos from moments you spent together over the past year. From enjoying New Year’s Eve in New York City to hiking together, you’ll love reminiscing on the special moments that you both spent together. Expert tip: Make it a tradition! Turn one Instagram photo book into a collection of the years spent as a couple. Share it at a special event or with future generations to show how your story together unfolds. Do you cherish your family albums from years ago? From film to digital, the evolution of cameras has improved over the years, but the purpose behind photography has remained the same: to capture life. Create a photo book of your little one growing older with all the Instagram photos you have shared of their memorable moments. If you’ve spent many miles on the road sharing stories, listening to your favorite tunes and seeing sites with your travel companion, consider compiling your #TravelGrams into a road trip photo book. Use unique embellishments to style every page and add text to show where you were on the journey. Not only will it be the perfect way to reminisce on the experience, but it will motivate you to plan another road trip! Put your selfies to use and turn them into a photo book! Compile the moments you shared with family and friends—whether it was on vacation or a regular day, you’ll love the chance to reflect on the good times you spent with family and friends without the need for a #tbt post. Did you make an effort to focus on your fitness this year? Turn your journey into a motivational spread. Pull pictures from your monthly progress on Instagram and add them to pages of a photobook with statistics, goals and motivational quotes. Choose your photo book size: You’ll have the option to choose any size photo book, but it’s common to stick with the original Instagram square with sizes in 8×8, 10×10 and 12×12. That said, you’ll still have the option to use the rectangular photos you shared on Instagram. Select a style: Choose a style that can turn your feed into a special keepsake. Use something more simple to let your photos do the talking like modern white, or try a style that reflects your chosen theme such as the travel, sports or everyday options. Connect your Instagram account: Once you’ve selected a style, upload your photos by authorizing Shutterfly to access your Instagram account. Then you’ll be able to view up to 60 photos from your feed at a time. Customize: Choose from various layouts, backgrounds and embellishments to create a personalized spread! From options like hashtag stickers to adding the same captions you used on Instagram, there are endless ways to customize your photo book. Preview and purchase: Once you’ve completed your Instagram photo book, preview the book from cover to cover to confirm that it’s exactly how you planned it. Then add it to your cart, include your shipping and payment information and get excited to receive the final version in your mailbox. Now that you have the step-by-step down, build your own Instagram photo book that you can treasure forever! Can’t find the time to make a photo book? Let our skilled designers make a photo book for you.